Well, for the first time in a long time I actually have some news to write about. Recently, Amazon has started a new service where authors can easily convert their existing books into paperback format. So, after a few days of tinkering and reformatting, I’ve converted The Most Boring Book Ever Written into a paperback that should be available for $7.99 (USD) very shortly. I decided that this would be a good book to start with because it’s short, and because it’s still strangely the most popular book I’ve written. 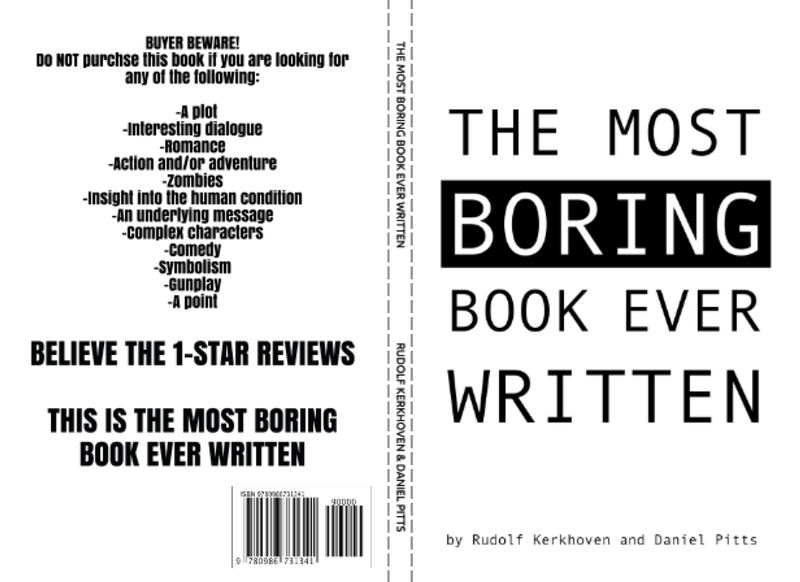 Perhaps people want to have a physical copy of something so very boring? It took a little while to change all the hyperlinks into page numbers and check all that over (I hope I didn’t miss anything) and soon enough I’ll see just how these Print-On-Demand books look. Assuming it all ends up looking good, I’ll convert all my other non-choose your own adventure books into paperback form in the coming months. However, I do not think I will do the same for the other books I’ve written with Daniel. They are simply too long with too many links that would be far too time consuming to convert. Maybe some day when I have a lot more time. And any new books I release, I also plan to concurrently publish paperback versions. It just feels so much more… bookish. And speaking of new books, editing of How the World Ends (which is the title I’ve now settled on) is coming along. I’ve gone through the entire story once, and am now going to focus on making a thorough edit of just Book One, with the goal of having it released on August 14th, 2017 (August the 14th is a significant date in the book). Assuming that goes to plan, I hope to have Book Two released early in the new year, and then Book Three in August 2018. These are some long term plans, but I feel good about the time I’m giving myself. Each book is about the length of The Year We Finally Solved Everything (except Book Three, which is about 40% longer), so short novels of that length should be revisable in the time I’m giving myself. I hope to get some mock ups of the cover for Book One in the coming months. I’ll have to email Whitney about that. Anyhow, there you go. News. And it sounds like I’ll actually have more news to write about in the coming months. Busy year!